Thanks for reminding me I’m single and that clearly I have nothing better to do that evening. So I have an idea that would be better than me being a temporary third in your love fest. You cook your someone special dinner! I mean what is more romantic than you taking the time and effort to create this wonderful evening for your someone special by making something easy, delicious, and beautiful? Then, if all goes well, the rest of your evening is just you two lovebirds and you don’t have to hear me banging and clanging dishes in the kitchen while cleaning up as you’re whispering sweet nothings into your “lovah’s” ear. So what is Braciole? 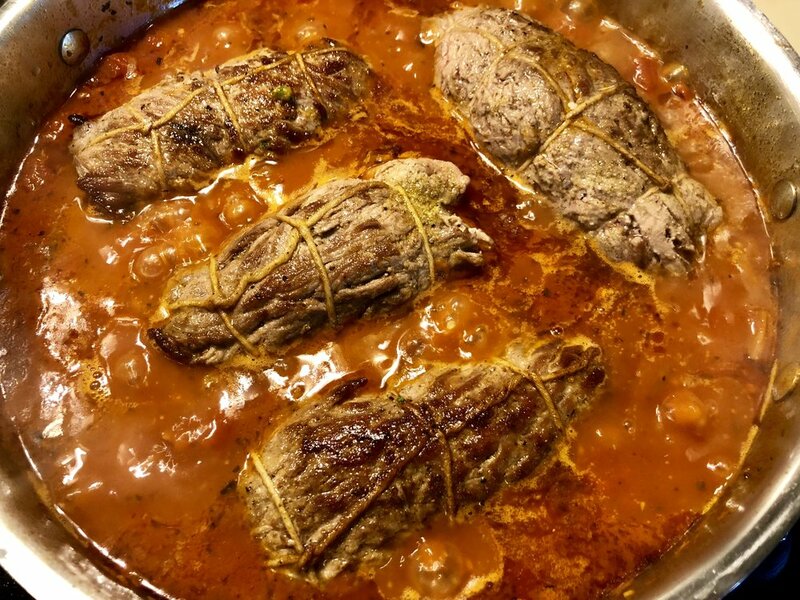 Braciole (commonly pronounced bra-zhule) in the United States is called Involtini in Italy. It’s basically thin cuts of meat (beef, pork, chicken, sometimes fish) that are rolled with breadcrumbs and cheese, then pan fried, and finished off in a Marinara or homemade tomato sauce. What else you add to the roulade is up to you as many recipes vary. 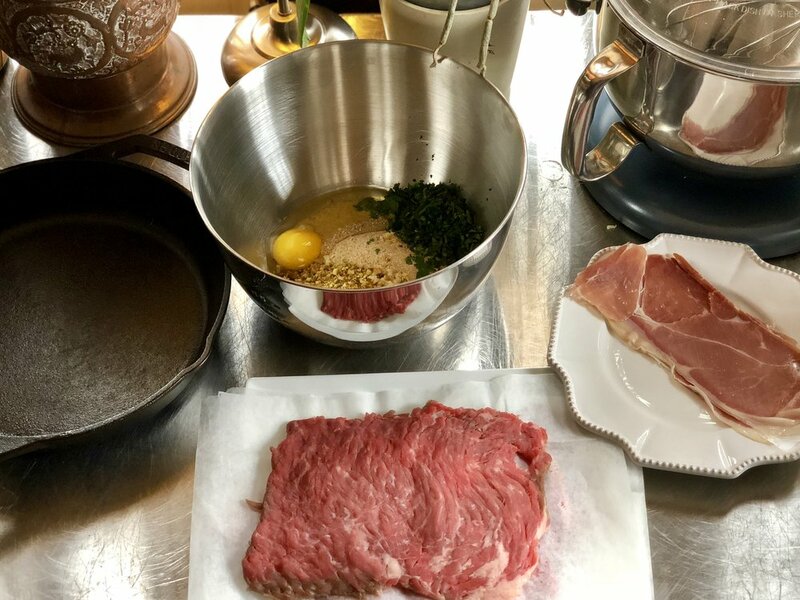 My idea of braciole is using thin pounded out portions of flank steak (you may also use top sirloin, ribeye, or tenderloin), and loading them up with flavors and textures like pistachio and two different cheese. The great thing is you can make smaller portions like am for this recipe or make one large braciole… it’s your call. Rolled, tied, and ready to be seared. Begin by portioning out your flank steak into three or four pieces. You may also use a whole piece of flank steak if choosing to make one large braciole. Pound the portions out thin and wide... remember you will be filling, rolling and tying this meat. 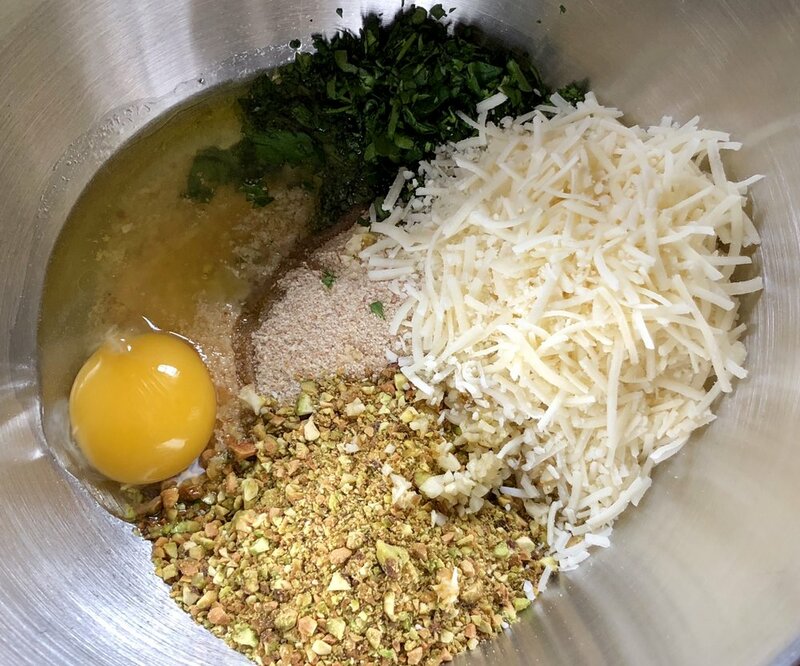 In a bowl combine the bread crumbs, pistachio, garlic, parsley, egg and both cheese. Mix to combine. Lay out flat the pieces of flank steak. Place a good size spoon full in the center of the flank steak and spread out evenly. Top the mixture with two thin slices of the prosciutto and press down firmly. The prosciutto may overlap and it is okay if you “color outside the lines” meaning the prosciutto does not have to fit perfectly inside the steak. When the portions have been filled begin to roll them up as you would roll up a burrito. Start at one end and roll the contents up with the meat, tucking in the sides, and ending with the roulade seam side down. Tie up the braciole with roasting twine or pin with wooden skewers/toothpicks. In a braising pan or tall sided fry pan add you marinara or tomato sauce and begin to slowly simmer. Remember you will be braising the braciole in the sauce so add enough sauce that it will be at least three-quarters up the side of the braciole. In a hot skillet add olive oil, enough to brown the braciole. Season the bracelet with In The Kitchen With Scotty “The Roast Beast” seasoning or use salt and black pepper. Sear the braciole on all sides until beautifully browned. Remove the braciole and place into the simmering tomato sauce, making sure not to overcrowd and the sauce is at least 3/4 up the sides of the braciole. Cover the pan and slowly simmer for 20 minutes. When ready to serve, remove the braciole from the pan and cut away or remove the roasting town or toothpicks. Slice the braciole and plate with the marina sauce it braised in. Serve the braciole with freshly cooked pasta and or a great homemade salad. Pour some wine, play some great music in the background, light a few candles, and let cupid take over. Kitchen cleaning can wait until the morning. Braciole braised in tomato sauce. Beautiful and loaded with flavor!